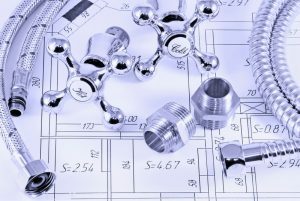 Plumbing Facts: “Plumbing” Comes from Latin for “Lead” | Ken Neyer Plumbing, Inc. The word plumbing comes from Latin, like many words in English. The Latin word plumbum means “lead,” which is why the symbol for lead on the periodic table of the elements is “Pb.” (Flashbacks to high school chemistry class!) Lead was the material used for the early plumbing systems of the Roman Empire. In fact, some historians have suggested the reason for the decline of Rome was too much lead in the drinking water! Few historians still believe this, but it’s a good reminder to homeowners today to have old lead and steel pipes replaced. This one often confuses people. They usually think a plunger is a plunger. But sink plungers and toilet plungers have different shapes. A toilet plunger has a longer, narrow end shape to allow it to fit better down the toilet drain. Sink plungers are flat to allow for easier access. We recommend you have both in your house, but if they can’t clear out a clog, call for one of our plumbers! How far back does plumbing go? The first irrigation ditches to bring water to crops may be considered a type of plumbing. There’s evidence for earth and asphalt pipes used in the Indus River Valley as far back as 2,700 BC that were used to carry fresh water. What about the earliest indoor plumbing? Since you’ve probably heard the phrase “… the best thing since indoor plumbing,” you might have wondered exactly how far back that goes. This isn’t an easy one to answer, but there are a few definite milestone dates. In 1829, architect Isaiah Rogers designed the Tremont Hotel in Boston with indoor plumbing. It was the first hotel to have this feature and it immediately became the model for class and luxury, with everybody scrambling to keep up. Rogers would go on to build the Astor Hotel in New York with enough water closets and bathrooms to serve 300 guests. By the 1840s, a few private homes were beginning to make the change as well. A dripping faucet may seem like an annoyance, but the amount of water wasted from the slow drip, drip, drip adds up to an enormous amount. For example, a faucet that drips once a second would waste one gallon over only four and a half hours, and 5 gallons daily. This adds up to more than 2000 gallons per year—and that means a substantial difference in water bills. Make sure you have any leaky faucets fixed, no matter where they’re happening in the house. Ken Neyer Plumbing, Inc. serves Greater Cincinnati and the Tri-State Area. Schedule great plumbing services with us today!